Intuitive, easy-to-understand controls are designed to simplify training, and reduce re-work. ReadySpace® technology reduces facility down-time and carpet cleaning costs. The debris tray prevents clogs in the drainage system, reducing downtime and service calls. Easy-to-clean Hygenic® solution and recovery tanks improve productivity and save time. Easy-to-clean Hygenic® solution and recovery tanks reduce mould, bacteria and odours, and maintain better indoor air quality. Carpets dry in less than 30 minutes, reducing slip and fall risk and minimising odours and moulds. Ergonomically designed Insta-Adjust™ handle optimises operator comfort. Easy-to-clean Hygenic® solution and recovery tanks enhance safety and reduce mould and bacteria that can grow in enclosed tanks. Convenient debris tray reduces operator contact with recovery water and prevents clogged hoses and drains. ReadySpace® technology keeps carpet looking cleaner, longer. Carpets in congested areas are clean and dry in under 30 minutes with ReadySpace® technology. 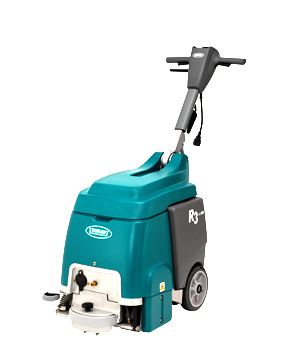 The R3’s compact size and optional tools enable it to easily clean congested and hard-to-reach areas. Convenient forward and reverse cleaning increase productivity in tight spaces to keep facilities always looking their best. Debris tray prevents clogs in the drainage system to reduce downtime and service calls. Compact design and ergonomic handles on the lift-off Hygenic® tanks ensure easy pick up and emptying. Easy-to-clean Hygenic® solution and recovery tanks save time, reduce maintenance and enable more time for cleaning.